Anna’s Secret Legacy Novel Facebook fans and sales double! 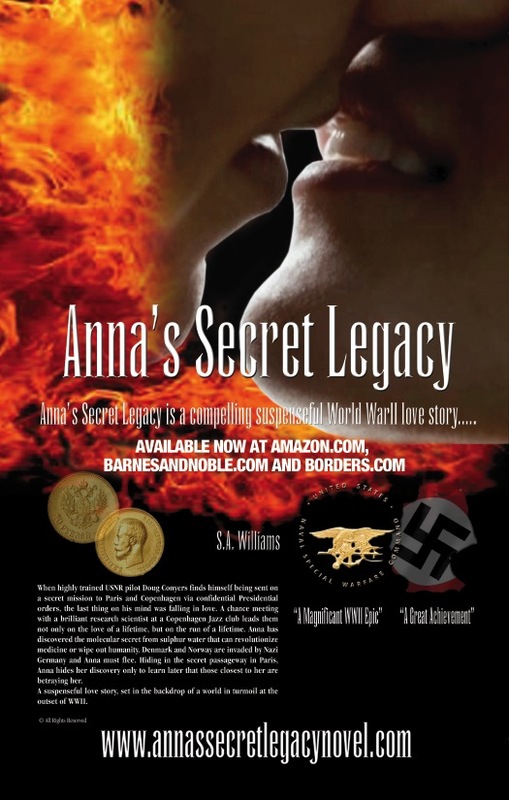 Created and copyrighted in 2009, Author Williams did not release Anna’s Secret Legacy until early this fall. An interview with Ms. Williams reveals that she started with the sequel first, producing the DVD teaser in the studio first. With the astute advice of Nicole Kidman and Brad Pitts script coach, Ms Adams told Williams the project was huge and too big for one project, and suggested starting at the beginning of the discovery of the molecular secret in WWII. 200,000 pages of research later, Anna’s Secret Legacy novel is in hot demand, with the website www.annassecretlegacynovel.com now in 42 countries. Author Williams is now well underway with the riveting sequel due out this summer. Available on Amazon.com, Amazon UK, Borders.com, WHSmith, UK, Barnes and Noble.com and Kindle! This entry was posted in Amazon, Anna's Secret Legacy, Anna's Secret Legacy Blog, Annas secret legacy novel, Barnes & Noble, Book Blog, Book Signing, Borders, Love Affair, Love affair, Pilots, Pressroom and events, Scientific Discovery, Travel, World War II. Bookmark the permalink. ← Anna’s Secret Legacy Novel in London Newspapers!